In this lesson, we will learn how to find the tangent and normal to a curve represented in parametric form. Find the slope of the tangent to the astroid 𝑥 = 𝑎 𝜃 c o s 3 , 𝑦 = 𝑎 𝜃 s i n 3 in terms of 𝜃 . Find an equation of the tangent to the curve 𝑥 = 1 + 𝑡 l n , 𝑦 = 𝑡 + 2 2 at the point ( 1 , 3 ) . Find an equation of the tangent to the curve 𝑥 = 𝑡 − 𝑡 2 , 𝑦 = 𝑡 + 𝑡 + 1 2 at the point ( 0 , 3 ) . 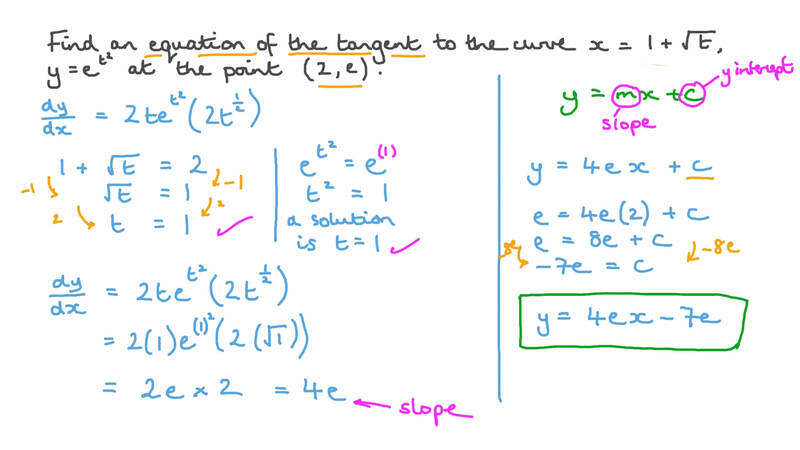 Find an equation of the tangent to the curve 𝑥 = 1 + √ 𝑡 , 𝑦 = 𝑒 𝑡 2 at the point ( 2 , 𝑒 ) . Find an equation of the tangent to the curve 𝑥 = √ 𝑡 , 𝑦 = 𝑡 − 2 𝑡 2 at the point corresponding to the value 𝑡 = 4 . Find the equation of the tangent to the curve 𝑥 = 𝑡 + 1 3 , 𝑦 = 𝑡 + 𝑡 4 at the point corresponding to the value 𝑡 = − 1 . Find an equation of the tangent to the curve 𝑥 = 𝑡 𝑡 c o s , 𝑦 = 𝑡 𝑡 s i n at the point corresponding to the value 𝑡 = 𝜋 . Find an equation of the tangent to the curve 𝑥 = 𝑒 𝜋 𝑡 𝑡 s i n , 𝑦 = 𝑒 2 𝑡 at the point corresponding to the value 𝑡 = 0 . Given that 𝑥 = 2 𝑡 − 9 3 , and 𝑦 = √ 7 𝑡 + 8 3 , determine the equation of the tangent to the curve at 𝑡 = − 1 . Determine the equation of the normal to the curve 𝑥 = − 4 𝜃 + 3 c o t , 𝑦 = 3 𝜃 + √ 2 𝜃 s i n s e c 2 at 𝜃 = 𝜋 4 . Find the equation of the normal to the curves 𝑥 = 2 𝜃 s e c and 𝑦 = 4 𝜃 t a n at 𝜃 = 𝜋 6 . A curve 𝐶 is defined by the parametric equations 𝑥 = 𝑡 2 and 𝑦 = 𝑡 − 3 𝑡 3 . 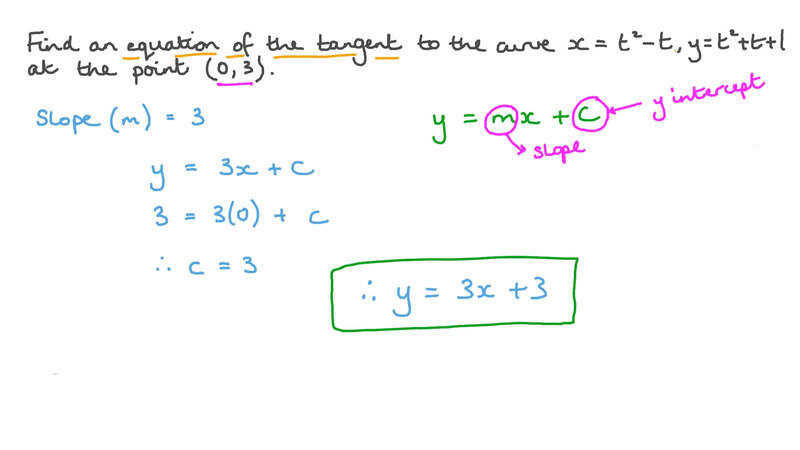 Find the two equations of the tangents to curve 𝐶 on the point at ( 3 , 0 ) . Find all possible points on 𝐶 where the tangent is horizontal. Find all possible points on 𝐶 where the tangent is vertical. Consider the curve 𝑥 = 𝑡 − 3 𝑡 3 , 𝑦 = 𝑡 − 3 𝑡 3 2 . Find all points on this curve where the tangent is horizontal. BThere are no horizontal tangents. Find all points on this curve where the tangent is vertical. BThere are no vertical tangents. Consider the curve 𝑥 = 𝑒 s i n 𝜃 , 𝑦 = 𝑒 c o s 𝜃 . A cycloid curve is given by the equations 𝑥 = 𝑟 ( 𝑡 − 𝑡 ) s i n and 𝑦 = 𝑟 ( 1 − 𝑡 ) c o s .
Find the tangent to the cycloid at the point where 𝑡 = 𝜋 3 . Find all points on the curve where the tangent is horizontal. Find all points on the curve where the tangent is vertical. Find all possible equations of the tangents to the curve 𝑥 = 3 𝑡 + 1 2 , 𝑦 = 2 𝑡 + 1 3 that pass through the point ( 4 , 3 ) . Find the value of 𝑚 at which the curve 𝑥 = 8 𝑚 + 5 𝑚 + 𝑚 − 1 3 2 , 𝑦 = 5 𝑚 − 𝑚 + 2 2 has a vertical tangent. Determine the equation of the tangent to the curve 𝑥 = 𝑛 + 9 𝑛 2 , 𝑦 = 𝑛 2 at 𝑛 = − 6 . Consider the curve 𝑥 = 𝑡 − 3 𝑡 3 , 𝑦 = 𝑡 − 3 2 . Consider the curve 𝑥 = 𝜃 c o s , 𝑦 = 3 𝜃 c o s .
AThere are no vertical tangents. Find an equation of the tangent to the curve 𝑥 = 𝜋 𝑡 s i n , 𝑦 = 𝑡 + 𝑡 2 at the point ( 0 , 2 ) . Find the equation of the normal to the curve 𝑥 = 3 𝜃 c o s , 𝑦 = √ 2 + 𝜃 s i n at 𝜃 = 3 𝜋 4 . Find the equation of the tangent to the curve 𝑥 = − 9 𝜃 c s c , 𝑦 = 4 𝜃 − 5 𝜃 c o t c s c at 𝜃 = 5 𝜋 3 . Find the equation of the tangent to the curve 𝑥 = 5 𝜃 − 2 c o t , 𝑦 = 4 𝜃 + √ 2 𝜃 s i n s e c 2 at the point 𝜃 = 𝜋 4 . Find the equation of the tangent to the curve 𝑥 = 9 𝜃 c o s , 𝑦 = √ 2 + 3 𝜃 s i n at 𝜃 = 3 𝜋 4 .